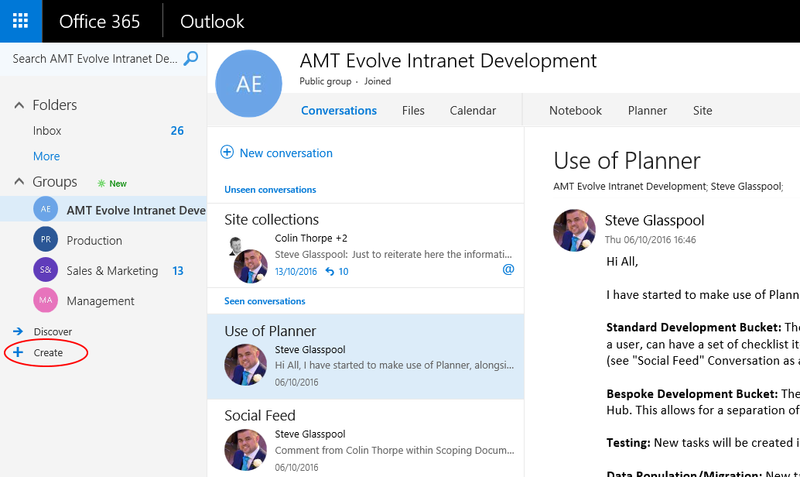 BlogHome » News » News » 60 Second Briefing – What are Office 365 Groups? Conversations for your team to consult and collaborate. Your company will need to decide when it is right to use Groups and when to use SharePoint Sites. Groups are great for quickly getting up and running with no input from IT, but they are invisible to people who aren’t members, and so any knowledge that is stored there will not be available to the rest of your organisation. For a quick overview, see this video from Microsoft. To create a group, go to ‘Mail’ in Office 365 and click ‘Create’ in the Groups area.